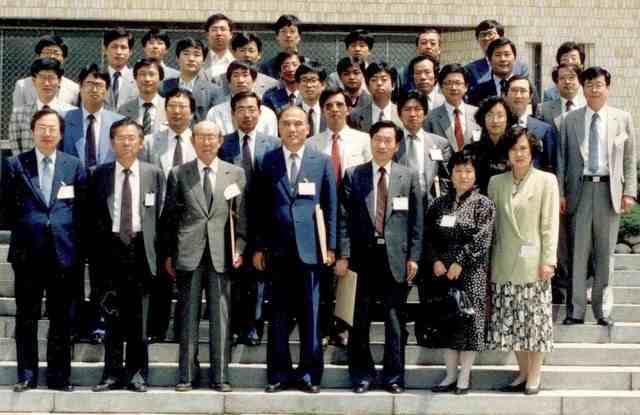 It was reported that the Korean Crystallographic Association was formed September 23,1989 and the Association consisted of about 100 crystallographers. from Newsletter of the Asian Crystallographic Association Volume 2 No. 1, May 1991 . 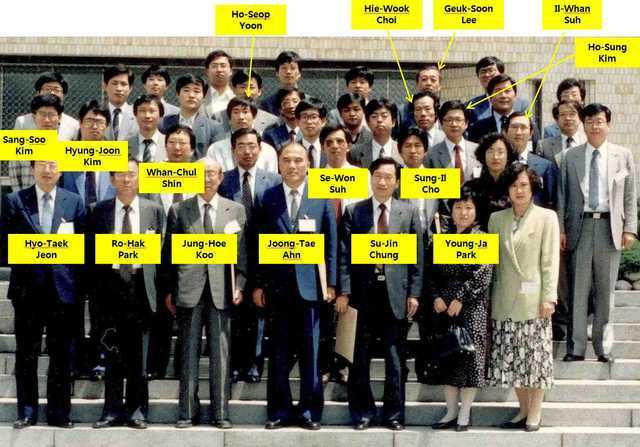 Participants at the 1989 KCA Meeting. A separate identification key is available. Individuals named in the key are Ho-Seop Yoon, Hie-Wook Choi, Geuk-Soon Lee, Il-Whan Suh, Ho-Sung Kim, Sang-Soo Kim, Hyung-Joon Kim, Whan-Chul Shin, Se-Won Suh, Sung-Il Cho, Hyo-Taek Jeon, Ro-Hak Park, Jung-Hoe Koo, Joong-Tae Ahn, Su-Jin Chung, Young-Ja Park.